I went to Southampton last week to meet up with some old colleagues from my previous workplace and decided to do a bit of shopping beforehand. Not only did I spend a good couple of hours in IKEA buying glasses with flamingos on (essential purchase) but I also popped into the giant Wilko in the West Quay Retail Park. I've been making a rough list in the back of my notebook with ideas of which type of seeds I'd like to grow this year. 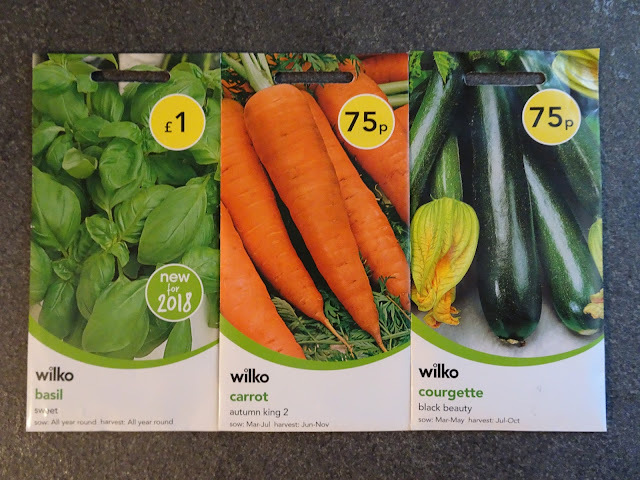 However, I've been putting off buying some because we've been in the process of extending our tenancy for another year on this property, and I didn't want to tempt fate and start sowing things if we then ended up moving! 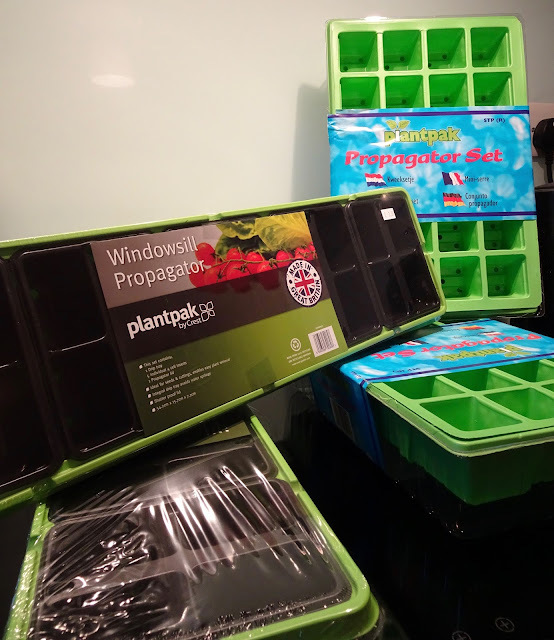 I've spoken about my Strawberry plants from Wilko in a previous blog post, and generally, I've always been impressed by the quality and standard of products that I've purchased from them. I've also been collecting various other seeds over the course of the last month or so. The Sunflowers came free with last month's Gardener's World, which was a real bonus because they're on my list of things to grow this year. It's been years since I've successfully grown Sunflowers. I tried to grow some last year, but the slugs managed to mutilate them before they had the chance to grow taller than about 4 inches! I've got my fingers crossed that this year will be more of a success. 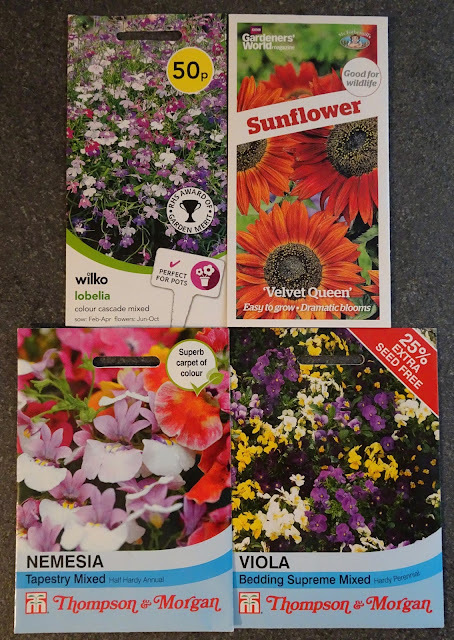 I'm hoping that the Nemesia and the Lobelia will be good 'filler' plants for the various planters that I've got in the garden. I fell in love with Nemesia when I was visiting Pisa a couple of years ago. There was a huge flower market, and the effect of hundreds of Nemesia plants all laid out side by side was just stunning. A huge tapestry of colour. I'll probably keep the Violas until later in the year for some Autumn/Winter colour. I was heading to the theatre, so I decided to restrain myself and not buy more than seeds in Wilko, but obviously, with so many seeds to plant, I just had to pop to Homebase on Friday and pick up some propagators. I spent roughly £8 in total on the ones above. In particular, I was really impressed with the 'Windowsill Propagators,' because they're the perfect size for my kitchen and bathroom windowsills. I have started off some Sweet Peas (which I'll talk a bit more about on Wednesday) but I won't start planting the rest of the seeds until March. What are your seed plans for this year? I love hearing about other people's plans for their gardens! Drop me a comment below. I'm a twenty-something knitter, gardener and general creative person. If I'm not in the garden, you can probably find me admiring yarn, or curled up on the sofa with the cat.